I'm sure there are a lot of people out there wondering,,,,what the heck is going on in the stock market. Well....It appears we are going nowhere,,,fast. We are stuck in a rut. Why? Well, the only logical thing I could think of is breaking this market down into sectors and see where the money is going,,,,or leaving. 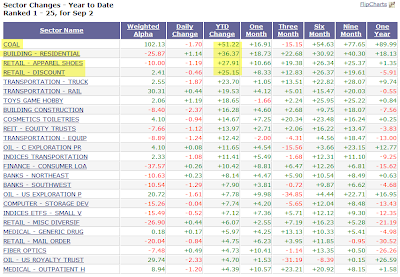 Thanks to BarChart for there fine tech analysis and breakdown on the sectors and stocks. Coal and the retail discount sector are the only ones I would have guessed to be near the top. I never would have guessed Residential building and Trucks making the top 5. 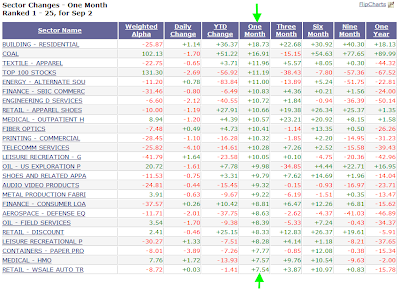 Perhaps they were oversold near the beginning of the year and there was value found in those sectors. Most Americans are steering clear of buying new trucks as gas prices recently hit $4.50 just 2 months ago and most believe that the housing market is crumbling. In the top spot for industries we have Coal. We all know China loves Coal and the demand for Coal in China is undying as long as there are billions of people living there that depend on it to keep there economy booming. 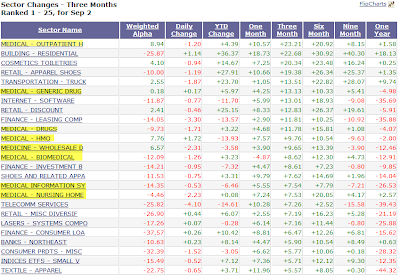 The Top stocks year to date list many coal stocks and some pharmaceutical names. 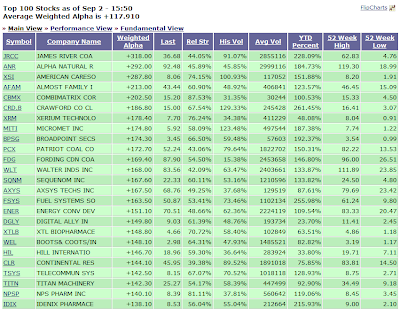 Although many of these stocks like the top dog; JRCC, are well off there highs. In the last 3 months a large number of Healthcare sectors have risen sharply. I'm not sure how McCain or Obama being elected will affect the Healthcare Sectors, but apparently some Institutional investors know something I don't. where is the VO url link? I think I took it down a couple weeks ago because I was pissed about my P/L. Part of the blogs charm is watching your p/l. We're rooting for you to overcome this setback just like the last time.